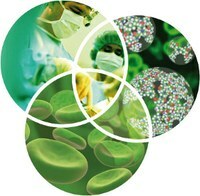 The Focus Research Group (FRG) on Biomaterials is engaged in Nano-medicine for localized treatment and imaging of cancer and arteriosclerosis, BioMEMS device fabrication for localized drug delivery using implantable and degradable and non-degradable devise structures, integration of BioMEMS devices with battery and communications platform technologies for improved performance, Hypothermia and integration of inductive heating methods to BioMEMS matrices and studies of synergy, non-food biofuels from bamboo and palm, and the bio-degradation of petroleum and its by-products for environmental health. This include activities related to bioremediation as well as Microbe Enhanced Oil Recovery (MEOR), Bio-corrosion of oil and gas installations, Biodegradation of plastics and the generation of biodegradable plastic alternatives; Biomedical imaging and computational techniques in pathology and forensic sciences, and the modelling of phenomena associated with cancer cells/tissue in Africa. implantable devices for cancer detection and treatment.